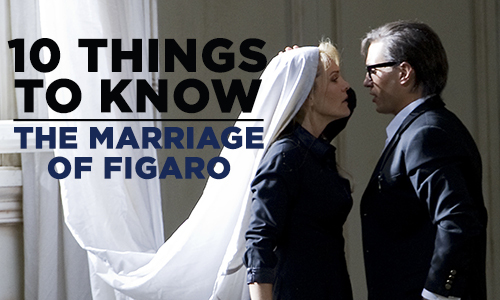 Claus Guth’s production of The Marriage of Figaro has had a lengthier gestation period than most. It premiered at the 2006 Salzburg Festival, was quickly revived there in 2007 and 2009, and culminated in the German director staging all three of Mozart’s collaborations with librettist Lorenzo da Ponte at the 2011 festival (Don Giovanni being added in 2008 and Così fan tuttein 2009). 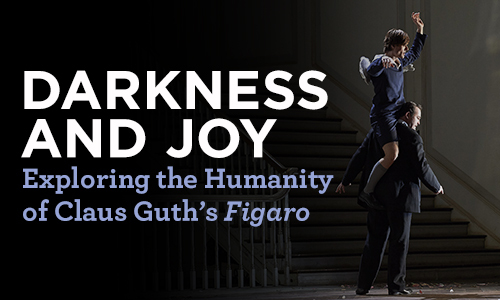 Initially, Guth resisted Mozart’s iconic comedy, questioning whether it was possible for him to confront the dangerous elements in a work whose music he had enjoyed with “uncontrolled excess”* while growing up. It was the Salzburg production’s first conductor, Nikolaus Harnoncourt, who managed to shift Guth’s focus away from Figaro’s distractingly glittery musical delights towards its intelligent, witty exploration of real, human relationships—the very elements that pushed comic opera beyond its more formulaic, slapstick Italian commedia dell’arte roots. From this emerged an interpretation that relocates the action from 18th-century Andalusia to fin-de-siècle Central Europe by way of the intense, modernist stage dramas of Ibsen and Strindberg, and the films of Ingmar Bergman. Mozart and Da Ponte’s opera is based on the play, La folle journée, ou Le Mariage de Figaro (completed in 1781, performed in 1784) by Pierre Beaumarchais, which was quite a controversial work. Written in 1781, it was banned in France by King Louis XVI, even though his wife Marie-Antoinette loved it. Louis was concerned about the play’s political message: the protagonist Figaro’s speeches suggested the aristocracy was corrupt, prone to abuses of power, and ultimately an illegitimate form of social organization. If that wasn’t enough, the play was also open to charges of immorality and licentiousness due to its sexual content. With all those ingredients in the mix, it is perhaps not surprising that when it was finally given a public performance in France in 1784, it was an enormous success and quickly became the most popular play of the 18th century.